MakeUseOf reviewed another amazing soundbar and they are giving it away to one of their fans! 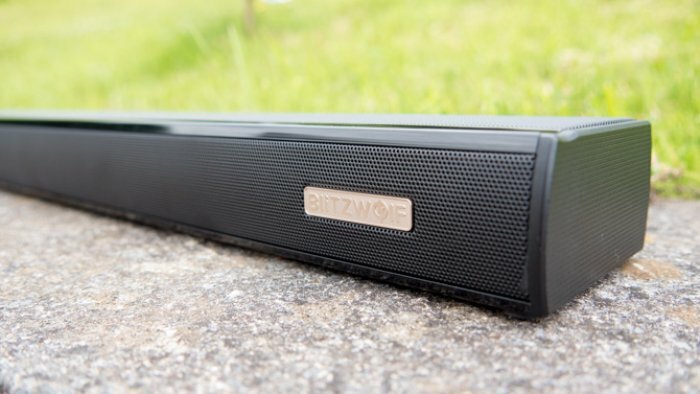 To enter in this Blitzwolf BW-SDB1 Soundbar Giveaway grab your free entries by following few simple steps listed down below! Size isn’t everything, but this thing is a rather satisfying 36 inches long. If you imagine the largest Bluetooth speaker you can, then lay 6 of them end to end, that’s about what this is. However, there is no battery inside the BW-SDB1: this is all speaker. The unit is 1.7 inches high, 3.4 inches deep, and weighs just under 4lbs. A discreet Blitzwolf logo sits on one end, with most of the body covered in aluminium alloy black grills, or glossy black plastic. While it’s not the height of modern design, it’s supposed to discreetly sit beneath glossy plastic TVs–and that it does well. I’m not a fan of metal speaker grills in general though. If you handle it too much, things will inevitably get stuck in there. Bonus entries: Share your referral link with friends to get additional 2 entries for each person who enters through the link. Winner will be contacted by email. Winner has to reply within a specified period to claim the prize.